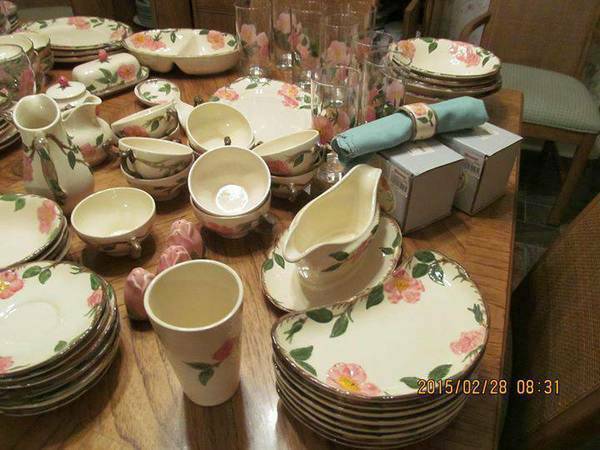 For sale are the following pieces of Franciscan Desert Rose dinnerware that have been collected since the 1950's. 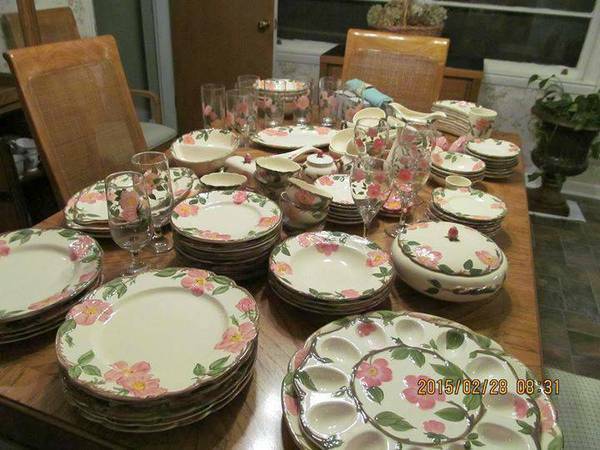 PLEASE NOTE THAT EVEN THOUGH THEY ARE IN SOME OF THE PHOTOS, THE ROUND SERVING PLATTER, THE DEVILED EGG PLATE, FIVE OF THE 8" LUNCHEON/DESSERT PLATES, THE LARGE 13" X 19" PLATTER, THE 9-1/2" COVERED VEGETABLE BOWL, THE SOUP TUREEN, AND THE COVERED CAKE PLATE, HAVE ALREADY BEEN SOLD). 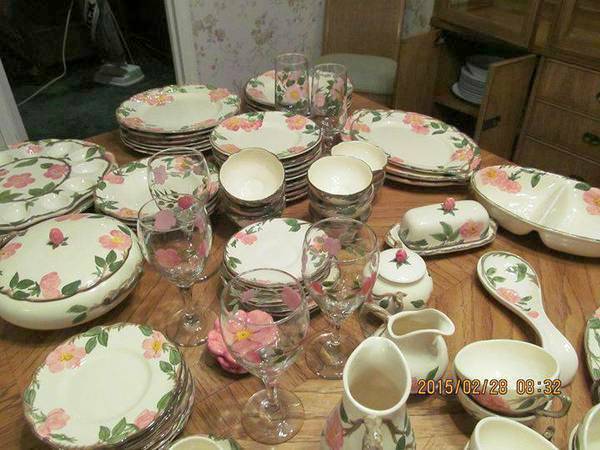 This large collection of 130 pieces is being sold separately for the prices noted below (you will see that I count a set as one piece (so, for example, a salt and pepper set is one piece)). I will also consider selling the entire collection. 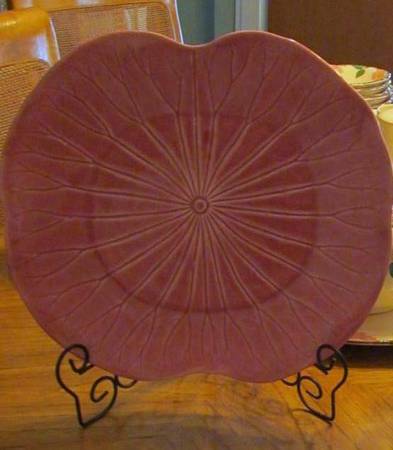 Based on my research and knowledge, the average replacement cost for all of the remaining pieces, as listed below, totals $2,977.00 (which includes the pink serving platter at the end of my list that is not Desert Rose, but has been used along with my collection due to its color and design). That price for all is negotiable. If you are interested in purchasing all of the pieces in this listing, please send me a message with an offer. Please also note that as with anything used, there may be imperfections. 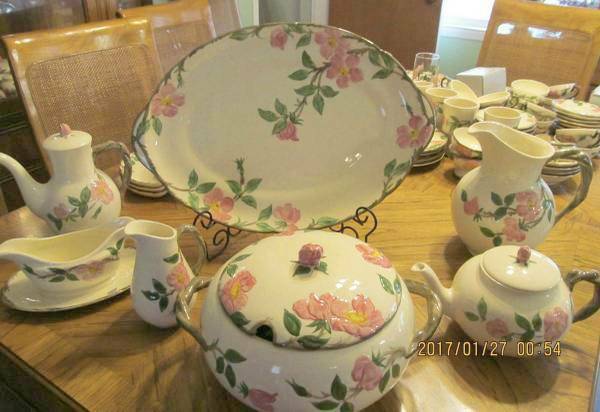 You are buying this "as is" and I have described the pieces to the best of my knowledge and have tried to include any issues that I noticed with any of the pieces. If you have any questions, please send me a message. Thanks for your interest.